FOOD SAFETY AND HANDLING: The kits and supplies are hand-poured, hand-folded and assembled in a food-safe, fully-licensed facilities that strictly follow the Department of Agriculture cleaning guidelines. The food items are all dairy-free and gluten-free but packaged in a room that may come in contact with wheat, soy, corn, nuts and other food allergens. 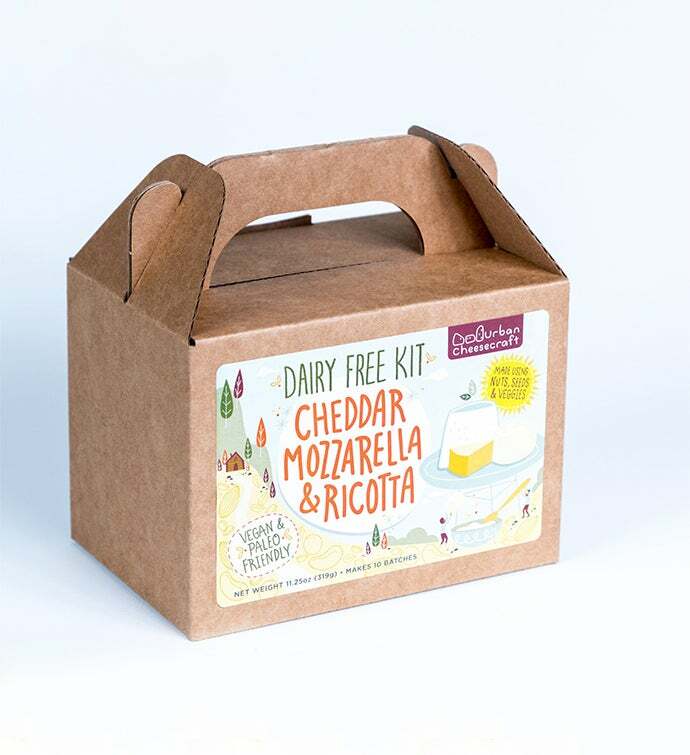 Shelf life for the Dairy Free Cheddar, Mozzarella & Ricotta Cheese Kit is 2 years. Do you daydream of that classic cheddar in your sandwich or creamy melted mozzarella on your pizza? There are so many reasons why people don't eat dairy - whatever it may be for you, this kit is here to give you delicious dairy-free options.